I thought I'd actually review a book for once. I originally thought that reviews would mostly what I used this blog for, but it turns out I've hardly done any. 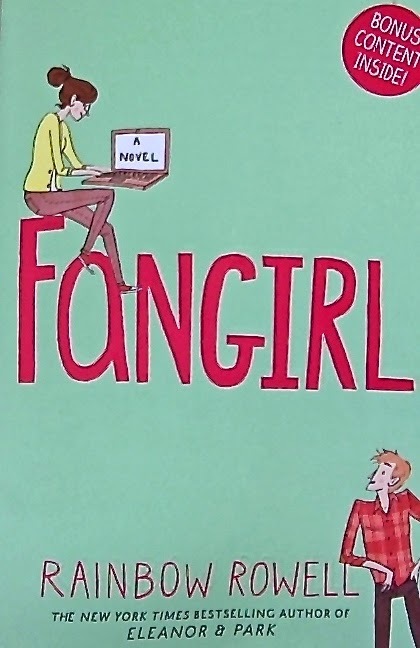 Today I'm going to talk about FanGirl, by Rainbow Rowell. This book has been given a lot of hype in the reading community.Though I don't read a lot of contemporary books I was excited, and a little late, to read it. (you will be warned of spoilers don't worry). I want to start by describing how much I love the cover, I love its simple design. I also LOVED the inside of the cover, because I wasn't expecting it. Inside the cover are illustrations of some of the main characters. 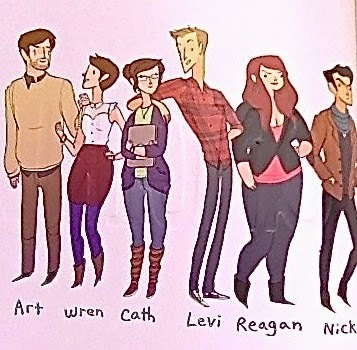 They are so cute and stylised, really helped me to picture the characters in my own head. On the inside of the back cover is a little comic-book-style, scene from the book. It was brilliant, like a teaser trailer. The actual book its self was really easy to get into, the characters were so real. 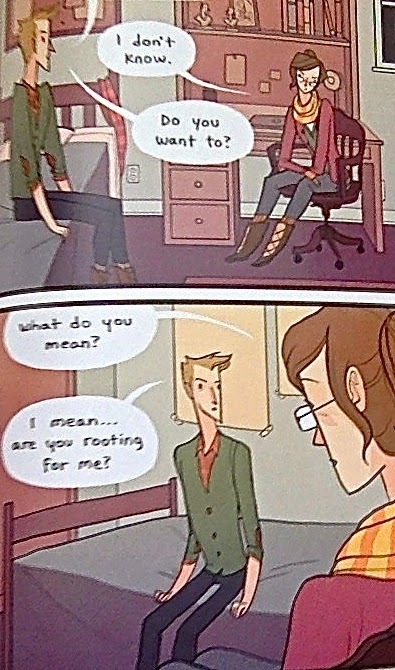 I related a lot to Cath, who doesn't get out much or talk a lot to people. Is it weird that I wish I was a little more obsessive? Cath dedicates so much of her time to writing her fan fiction. I wish I had that much dedication and persistence. I liked that the 'Simon Snow' series was so familiar, almost running parallel with the Harry Potter series. I loved the college setting, I wish I had read this a few months ago when I had started my first year of 'proper' college. The situations were so familiar, and the people I could almost match up to ones in my own life. There was a good bit of swearing, just saying for the younger readers out there, growing up in Ireland I'm used to hearing it, but seeing it written down, was strange. At the end (now comes a few spoilers, skip if you want to the next paragraph), I loved to see how she didn't agree to take credit with Nick. I loved how she didn't give him the inch it would have taken him to take advantage. I also loved that she was able to see passed the imaginary deadline for finishing her fan fiction. I know all about imaginary deadlines and how stressful and all-important that they can seem, so seeing Cath see past that was really reassuring in a strange, personal way. All in all, I loved this book. I loved how familiar the characters seemed by the end of it, how much I could relate to the main character. I loved the familiar circumstances and how cute the relationships were. I would read it again in a heartbeat.